Sensory Overload in the Sandhills. 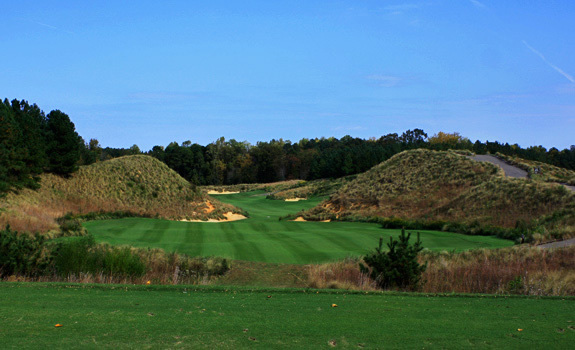 A few minutes north of Pinehurst is Tobacco Road, a Mike Strantz design that may be one of the most unique golf experiences in the area. 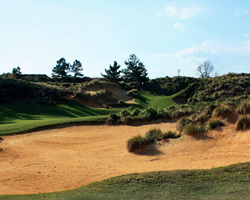 Built out of an old sand quarry, the routing features massive dunes, waste areas and all kinds of trouble to gobble up wayward shots. Blessed with equally massive fairways, the course is forgiving and playable. Not overly long, but with a high course rating and slope, the course presents numerous ways to play most holes. The visual distractions of the scenery will play havoc with your mind and most likely your swing. The opening hole presents you with the character of the course requiring your drive to split the 80 foot mounds protecting the landing area. A second shot through another gap leads to the large green fronted by deep bunkers. Eleven and uphill Par 5, is a slinging dogleg right, with a massive chasm of sand all the way from tee to green on the right. Reachable with 2 perfect shots there is no room for error right without a cherpa. Hole 16 is a rescue or long iron to a blind valley between the mounds leaving an uphill approach to a severely sloped green. 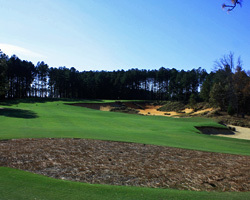 The finish requires a drive over a vast wasteland of sand and scrub to an elevated fairway. Aim for the stove pipe and hope.